Hello, I am Al - Welcome to MY HOME PAGE! Your web odyssey took you to the 'Wild West', to Calgary , Alberta, Canada, my home for more than forty years. 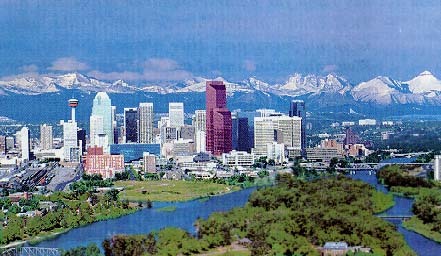 Situated just 100km (60 miles) East of the Rocky Mountains, Calgary is the hub for visitors to Western Canada. To the East you can venture into the prairies for more than 1200km or close to 800 miles. A two hour trip takes you to the badlands, a kind of desert which is not suitable for farming, but instead takes you back to prehistoric times when dinosaurs roamed this region. Fossil finds are not uncommon - even today. Visits to the spectacular Tyrrell Museum at Drumheller and Dinosaur Provincial Park at Brooks are a must. Another place worth visiting to the east are the Cypress Hills in the midst of the prairie and which straddle the Alberta - Saskatchewan border like the hump between the neck and back of the buffalo. To the West, of course, rise the majestic Canadian Rockies with their more than 3000m (10000 feet) peaks. A drive on the TransCanada Highway through the cattle country of rolling foothills and through the Stoney Indian reserve takes you in just over an hour to world famous Banff National Park. Banff and Jasper National Parks in Alberta together with Kootenay and Yoho National Parks in British Columbia form a wilderness area of nearly 19000 square kilometers (7500 sq miles). Places worth visiting besides Banff and surroundings are Johnston Canyon, Morraine Lake and Lake Louise in Banff National Park. The Icefield Parkway, one of the most scenic highways in the Rockies and boasting hundreds of glaciers visible from the roadside, brings you to Jasper National Park. Along the way make sure to stop at Bow Lake, Peyto Lake on Bow Summit, Athabasca Glacier - one of six glaciers fed by the 325 square kilometer large Columbia Icefield -, as well as at Sunwapta and Athabasca falls. Further west along the TransCanada Highway in Yoho National Park you can observe trains going through the spiral tunnels. And don't miss out on taking two short side trips to Takakkaw falls as well as Emerald Lake and the Natural Bridge of the Kicking Horse River. Going South from Calgary you reach the U.S. border in a few hours. Just 250km (160 miles) away, Waterton Lakes National Park in Alberta and Glacier Park in Montana form the International Peace Park on both sides of the 49th parallel, the border with our neighbours to the south. This is grizzly bear country. In Waterton, take a boat trip to Goat Haunt on the US side or stop en route for an exhilerating day hike to Crypt Lake. Cameron Lake and Redrock Canyon are other places worth visiting around Waterton. In Glacier Park take the 'Going-to-the Sun' road from St.Mary's to breathtaking Logan Pass. And before you reach West Glacier stop at MacDonald Lake for a refreshing dip in the cool mountain waters or a coffebreak at the lodge. Taking the highway North from Calgary you are bound for Alaska. The road feeds into the Alaska Highway which starts officially in Dawson Creek, British Columbia. But long before you get there you reach after 300km (180 miles) Edmonton, the provincial capital of Alberta. West Edmonton Mall, the largest shopping centre in the world should not be missed before continuing the journey through Northern Alberta's land of 1000 lakes (and billions of mosquitos :-). Calgary offers a great variety of outdoor activities and is therefore one of the most attractive cities for outdoor and recreation enthusiasts. The city itself has a system of paved pathways covering about 300km (190 miles). These pathways follow for the main part the two river valleys of the Bow and Elbow. Hiking, jogging, cycling are just a few of the many activities which the young and old engage in. A multitude of parks invite you to stop and watch the wildlife or enjoy a picnic. 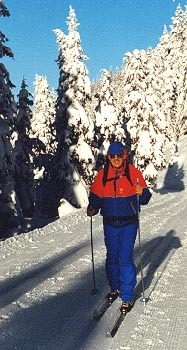 Besides these recreational activities I work also as a freelance tour guide on bus tours, primarily in Western Canada between Calgary and Vancouver, but also in Central Canada in the Toronto - Montreal - Quebec corridor. So if you plan a holiday for a group in my corner of this world make sure to I can refer you to tour operators who will put a customized tour together for you and I will be glad to guide you through this beautiful part of Canada. My home page is stored on the WWW server of the Calgary Unix Users Group (CUUG) in Calgary, Alberta, Canada. CUUG operates a resource centre with some six servers and has a membership of about 300. My own system consists of a MacG4 and has a DSL connection to the Internet. Although I have worked with almost any thinkable system starting with IBM mainframes, I have come to appreciate the Mac because of its simplicity compared to any of the other systems. That's why I am called a Mac bigot (still). Some of my Unix conversant colleagues are trying to convert me to Unix and I am actually starting to get my feet wet. However, I must say that the Unix command level interface is archaic and reminds me of the mainframe pioneering days. On the other hand, Unix and the TCP/IP network seem to be doing a pretty good job of letting you navigate the Internet :-)). That is in brief all about me and my world, at least as far as you might be interested in it. If you have any comments or would like to see more detail or pictures drop me an Email (oppermaa at cuug.ab.ca).